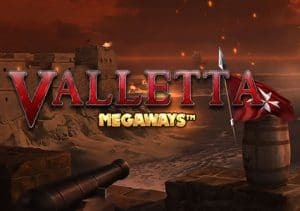 Based on a 16th century siege on the Mediterranean island of Malta, Valletta MegaWays is a 6 reel video slot from Blueprint Gaming. Played using the MegaWays game engine, the number of ways to win can reach up to 15,625. Also on offer here are streak respins and a free spins round. Play this volatile game on all devices from between 10p and £10 per spin. Like most video slots in the Blueprint Gaming catalogue, the design here is excellent. A castle overlooking a harbour forms the backdrop to the action here. It reminded us of Kings Landing from Game of Thrones. On the reels you’ll see iron A to 9 symbols alongside a sword, shield and map. The best symbol is the lion rampant banner which pays 0.5, 1, 5, 10 and 25 times your bet if you land 2, 3, 4, 5 or 6 on adjacent reels. The knight in armour is the wild. This substitutes for all symbols apart from the bonus. As a MegaWays title, the number of symbols on each reel changes with each spin. At their maximum they can combine to offer up to 15,625 different ways to win. There are 2 main features on offer in Valletta MegaWays. Valletta Streak feature – this can strike following any winning base game spin. The winning symbols are held and the reels spin again. If a new matching symbol or wild hits, they too are held and another respin follows. The streak spins continue until no new matching symbol or wild joins the winning cluster. A final payout consideration then follows. Valletta Free Spins feature – land 3, 4, 5 or 6 of the bonus symbol (the cannon) on the same spin and you’ll receive 10, 12, 15 or 20 free spins. The Valletta Streak feature becomes live following every winning spin during the free spins round. If you don’t want to wait to trigger the free spins round, you’ll have the option to buy it for 100 times your bet with the Bonus Bet feature. Just click on the tab to the left of the reels. Valletta MegaWays is another impressive addition from Blueprint Gaming. You won’t find many better-looking games than this and the sweeping orchestral score gives the game a suitably epic feel. The features stack up rather well too, especially the Valletta Free Spins feature where the streak respins can really have an impact. Be warned though, this is a volatile game so expect plenty of lengthy down spells. However, you can win 10,000 times your bet on every spin or free spin. MegaWays video slots are becoming more and more popular – Blueprint Gaming offer more than other provider with Vikings Unleashed MegaWays my choice.